“The end of the World” is, has been and will be a source of inspiration for stories, books and films. For the latter, we have accounts that go from the silliness of “2012” or “Armageddon” to the more accomplished “12 Monkeys” passing by the “Dr Strangelove” treatment. And so one of the questions hanging in the air with these films is “what would you do on your last day on Earth?”. 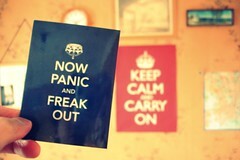 Perhaps you would go for the “Keep calm and carry on” attitude or maybe for the “Now panic and freak out” perspective. Yesterday, I faced that same question yet again while watching Don McKellar‘s Last Night in the BFI. In this particular case we are not told any scientific (or otherwise) explanation at the heart of the doom scenario: no sign of a nuclear winter, Sun dying, global warming or Gods’ wrath. In that sense, it is great because there is no heroic figure that rises from the ashes of the Earth to save the day Bruce Wills’ style. Instead, we are in placed in Toronto, Canada, where normal people go about their not-so-normal lives. Everyone in the film, even those who are causing havoc in the streets, seems utterly resigned to the unfolding events. So much so that, downtown Toronto, will host some sort of New Year’s Eve-like ‘countdown’ to the end, which quite aptly for them is scheduled to happen at midnight. Quite handy, really! I am not too sure that most people would react as imagined in the film when faced with the prospect of the end. I guess there would be far more rioting and panicking, but you never know. I was quite pleased with the way in which the media react to the news: rather than a painstaking 24/7 reporting on every single detail of the demise, they treat it as well as a New Year Eve-like opportunity to play ‘The 500 Greatest All-time Hits’. Great performances of McKellar himself as Patrick, a gloomy man disaffected by the recent death of a woman he loved, and of Sandra Oh as Sandra, a young woman stranded in the city after her car is vandalised while she is shopping. Patrick has chosen to spend the last moments on his own after having had a cringey ‘Christmas Dinner’ at home, while Sandra is desperately trying to get home and close the pact with her husband Duncan (played quite suitably by the director David Cronenberg). Patrick and Sandra are drawn together by the circumstances and in the same way that their stories collide, the rest of the characters are shown to have some form of connection. This reminded me of the narrative style used by González Iñárritu in “Amores Perros“; the inevitability of the end is reflected by the unavoidable fortuitous encounters. In that manner, Duncan, a gas company executive ends up talking to the rest of the characters as he spends his last hours at work leaving messages on his costumers’ answering machines. Or Patrick’s best friend Craig (Callum Keith Rennie, of Cylon fame in BSG) who has chosen in his final hours to try and complete a check list of sexual fantasies that include sleeping their old French teacher (Geneviève Bujold), and even with Patrick. The professeur-étudiant dialogue between Mme Carlton and Patrick does put a smile on your face. There were a couple of things that I really liked: 1. the unmistakable seventies decor and 2. the fact that the entire drama is played out in broad daylight: darkness never falls, even at the inescapable demise at midnight. Finally, should the world come to an end as seen in Last Night, at least there seems to be a flicker of human spirit and solidarity, for instance in that scene when Patrick explains to Sandra the socialist significance of Pete Seeger’s version of José Martí’s “Versos Sencillos” used in the well-known song “Guantanamera”.